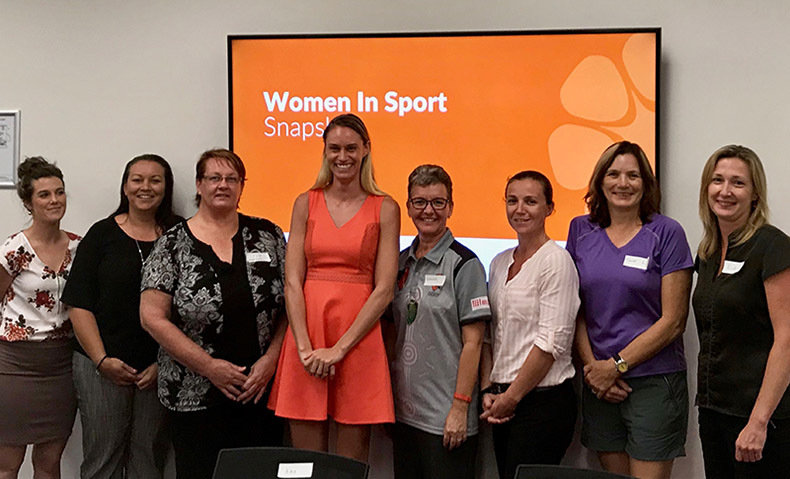 A new Women in Sport Advisory Committee (the Advisory Committee) has been established to provide strategic and practical advice to improve the delivery, recognition, promotion and development of participation and leadership opportunities for women in sport in the NT. In finalising membership of the Advisory Committee, consideration was given to ensuring a balance of a wide spectrum of sports being represented, as well as a range of experiences and skills. Left to right: Brittany Ward, Sheralee Taylor, Sue Marshall, Alex Billeter, Louise Morrison, Trudy Grenfell, Sue Kendrick, Ewa Finch. Louise Morrison is a Certified Human Resources specialist with experience in State Government, not for profit and private organisations at management level. Louise grew up in WA and has lived in Darwin for five years, running her own business consultancy which specialises in training and development, communication, change management, strategic and operational planning and project management. Louise has been involved in cricket for over twenty five years in both WA and the NT. In WA, Louise played B-Grade cricket at Melville Cricket Club and served as President in 2002. She was appointed volunteer Manager of the WACA state women’s cricket team (Western Fury) and provided support for all off field and touring matters for squad members. Louise is a Cricket Australia accredited Community Coach has worked as a volunteer in cricket at local club, state and peak body level and currently volunteers with the NT Female Cricket Academy in Darwin. She has experience and a passion for encouraging integration of women into clubs as players and officials, to encourage a gender balance at the grassroots level, encouraging equality, respect, opportunities and pathways for girls and women to pursue their chosen sport as well as encouraging clubs to map a strategy and plan for recruiting and retaining women. Alex Billeter was born in Florida, USA where she played soccer semi-professionally and refereed at a high level, Alex also graduated the University of North Florida with a Bachelor Degree in Marketing. In 2009 she moved to Australia and has been heavily involved in soccer including coaching a women’s team in Darwin for 3 consecutive seasons and is now the Referee Development Coordinator for the NORZONE competition. Alex was the first female to ever referee a Men’s Premier League soccer game in Darwin and the first female to be selected to represent the NT as a referee at the Soccer National Youth Championships. Alex chairs the Women and Girls Advisory Committee which is committed to increasing participation of women and girls in soccer and has worked on the “NO MORE” family violence campaign which uses sport as an avenue to speak to men about family violence and being inclusive of women in sport. She has also participated in the NT Thunder Academy as a player, played for the Waratah FC women’s team and is a committee member on the Rising Tahs Committee. Alex plays volleyball and represented the NT in Indoor Volleyball at the Arafura Games in 2011. Alex is a big believer in pushing the boundaries and ‘gender norms’ when it comes to promoting females in sport and employment and believes that women are capable of doing anything they put their mind too. Brittany Ward is a 27 year old former collegiate athlete from Austin, Texas. She moved to Australia over five years ago, and has spent most of this time competing in the WSBL (Western Australia), QBL and ISL (Queensland) and DBA (Darwin). Brittany’s sporting mentality and managerial skills have given her opportunities to be the Tournament Night Manager for Midnight Basketball; found and manage Rising Stars Basketball (a program for people with disabilities); conduct coaching and umpiring accreditation courses in various regional Northern Territory communities; facilitate Elite Skills Training sessions for 10-15 year olds; volunteer as Development Coach for U18s Men’s nationals, as well as Head Coach U12 Division 1 Girls team for Palmerston Power. She was also selected by Basketball Northern Territory to travel as development coach for Adelaide 36ers in 2017. Brittany is incredibly driven to share her passion for sport, which she believes gives young women invaluable opportunities and vital life skills. Ewa Finch is a Senior Project Officer in the Innovation division with the Department of Trade, Business and Innovation, having worked in the Northern Territory Government for 20 years and lived in Darwin for over 30 years. Through her public service work she has experience in project management as well as many governance roles working with boards and committees. Ewa has been the Secretary and is currently the Vice President of the Ace Junior Tennis Supporters Club and was the Manager of the Tennis 12yrs and Under Championships in 2017 for School Sports NT. Ewa has two children who are heavily involved in their chosen sports and over the years has provided a great deal of time to volunteering towards the sports and associated clubs in many forms including fundraising, committees, management and support and will continue to further support and work with School Sports NT in 2018. She values equality, resilience, fun and inclusion as part of the sports journey. Ewa feels that athletes who are driven and motivated can overcome challenges through hard work and believes in the strong collaboration of sports and education with successful and healthy people. Shahni Wellington has been in the Northern Territory for a few years and is a proud Jerrinja woman from the south coast of New South Wales. She is currently a Premier League netball player for Darwin Netball Association, having played at a local, state and national level. Shahni is a journalist, and was recently a finalist in the NT Media for best sports journalism. Shahni also worked as a Coach and Umpiring Development Manager for Netball Northern Territory, having over a decade of experience in coaching, officiating and playing. She is passionate about sports at a grass roots level and brings a young perspective to advisory matters. Sheralee Taylor is a proud Arrernte women, with significant ties to many community sports in and around Alice Springs. Sheralee was involved in sport from a young age, particularly softball where she has represented the Northern Territory and participated in an Australian Institute of Sport training camp. Sheralee has been involved in a range of sports including AFL, Basketball, Hockey, Netball, Cricket and many others. Sheralee is a strong advocate for women participating in sport. Sue Kendrick has been a Northern Territory resident for over 30 years and is a life member of Darwin Netball Association and Northern Districts Club Player. Sue has been an NT representative player for Netball, Basketball and Judo, has dabbled in Volleyball and Touch Football and has performed roles as a coach, umpire and netball administrator. Sue is a long term member of the Darwin Netball Association Management Team (President and Player Representative), past committee member of the Kangaroos Auskick/Junior AFL, club and representative coach. Sue Marshall has lived in the Northern Territory for over 30 years. Sue has officiating qualifications in Tennis, Rugby League, Squash & Basketball and has been involved as an official with Basketball NT & Darwin Basketball for 30 years, and regularly runs courses to train basketball scorebench officials. She has officiated NBL games held in Darwin including for the Perth Wildcats & the Top End Challenge (where all 9 NBL teams came to Darwin for pre-season tournaments) as well as numerous National Basketball events run by Basketball Australia held in Darwin and was on the organising committee to train official as well as officiating herself for the Basketball events at the Arafura Games held in Darwin. Sue was invited to speak at the “Fair Go for Officials” forum run by the Australian Sports Commission held in Darwin, and, in 2012 was awarded Life Membership of Darwin Basketball Association for assistance with officials, in 2008 she received the NT Sports Award for Official of the Year and was a volunteer for the 2000 Olympics and Paralympics held in Sydney. Sue has qualifications in Accounting and as such, has been involved in various boards and committees as the Finance Director, Treasurer and/or Committee Member for associations such as Squash NT, Darwin Squash Association, Nightcliff Tigers NTFL Club, Tracy Village Basketball Club, Ansett Basketball Club, Basketball NT, Darwin Basketball Association, Brothers Rugby League Club, Gardens Tennis Association and Tennis NT and has presented at the “Leaders in Sport Conference” on finance related matters. A Territorian for more than 30 years, Suzi Hullick has played multiple sports at state level both here in the Territory and in Victoria (as a junior). Suzi has been involved in several volunteer management roles for Hockey and Netball over the past 25 years. Being the mother of 2 boys who have represented the Northern Territory in Hockey (State, NTIS and Futures) she is well experienced in sports administration and the complexities that face Territory families and local sports. Suzi is currently a member of Darwin Golf Club and a long term member of East Darwin Hockey Club and is excited with the prospect of supporting our Women in Sport agenda here in the Territory. Trudy Grenfell spent her early childhood in various country towns in Queensland, and moved to the NT at the age of 16. Whilst at school, Trudy was heavily involved in athletics, winning aged champion almost every year. She finished her schooling at Katherine High School, and moved to Brisbane for her partner’s rugby career. Whilst in Brisbane, Trudy completed a touch referees course and refereed twice a week, whilst playing one night a week. Trudy moved back to Darwin and played Women’s Rugby for South Darwin, being selected for the NT Lloyd McDermott Rugby Union team playing in Sydney 2005. She then joined the NT Police Force and has been employed there ever since. Trudy has moved to various communities within her career and has maintained her love for sports and an active lifestyle. Trudy has two children who also enjoy sports and wants them to have more experience and opportunities for success than she had. To raise any concerns, issues or to share news and stories regarding the topic of women in sport and active recreation in the Northern Territory the Advisory Committee can be contacted by email at womeninsport@nt.gov.au.